Home building generates substantial local economic activity, including new income and jobs for residents, and additional revenue for local governments. The National Association of Home Builders has developed a model to estimate the economic benefits. The model captures the effect of the construction activity itself, the ripple impact that occurs when income earned from construction activity is spent and recycles in the local economy, and the ongoing impact that results from new homes becoming occupied by residents who pay taxes and buy locally produced goods and services. In order to fully appreciate the positive impact residential construction has on a community, it’s important to include the ripple effects and the ongoing benefits. Since the NAHB model was initially developed in 1996, it has been successfully applied to construction in over 500 projects, local jurisdictions, metropolitan areas, non-metropolitan counties, and states across the country. This report presents estimates of the metro area impacts of home building in Ada County, Idaho. The comprehensive nature of the NAHB model means that the local area over which the benefits are spread must be large enough to include the places where construction workers live and spend their money, as well as the places where the new home occupants are likely to work, shop, and go for recreation. In practice, this usually means a Metropolitan Statistical Area (MSA) as defined by the U.S. Office of Management and Budget (OMB). 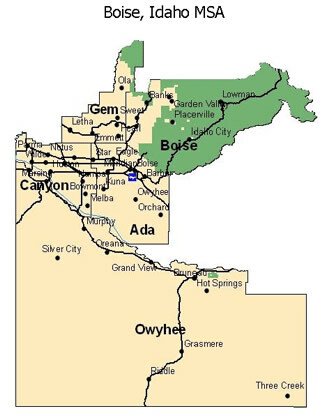 Based on local commuting patterns, OMB has identified the Boise, Idaho MSA as a metro area consisting of five counties (Ada, Boise, Canyon, Gem, and Owyhee ) in Idaho (see map to the right). In this report, wherever the terms local or Boise are used, they refer to the entire metro area. The report presents estimates of the impacts of building 1,532 single family homes, based on construction activity in Ada County in calendar year 2008. The NAHB model produces impacts on income and employment in 16 industries and local government, as well as detailed information about taxes and other types of local government revenue. The key results are summarized below. Additional details are contained in subsequent sections. These are local impacts, representing income and jobs for residents of the Boise MSA, and taxes (and other sources of revenue, including permit fees) for all local jurisdictions within the metro area. They are also one-year impacts that include both the direct and indirect impact of the construction activity itself, and the impact of local residents who earn money from the construction activity spending part of it within the local area. These are ongoing, annual local impacts that result from the new homes being occupied, and the occupants paying taxes and otherwise participating in the local economy year after year. In order to fully capture the impact residential construction has on a community, it is important to account for the ongoing benefits as well as the one-time effects. The above impacts were calculated assuming that new single family homes built in Ada County have an average price of $275,000; are built on a lot for which the average value of the raw land is $7,500; require the builder and developer to pay an average of $10,500 in impact, permit, and other fees to local governments; and incur an average property tax of $1,802 per year (which incorporates a homestead exemption of $100,938. This information was provided by the City of Boise Planning and Development Services Department, the City of Meridian Building Department, the City of Eagle Building Department, the City of Star Building Department, the City of Kuna Planning Department, the Garden City Planning Department, the Ada County Development Services Department, the Ada County Assessor’s Office, and the Ada County Highway District Technical Services Division. Impact of Building 1,532 Single Family Homes in Ada County, Idaho.